It's all in the details. 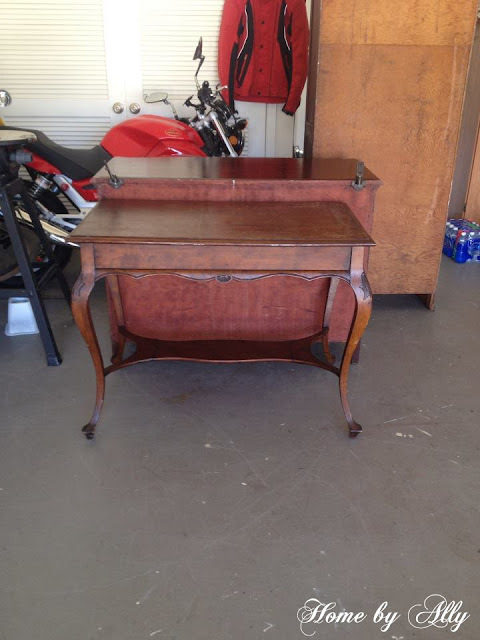 And there's no exception with this beautiful antique that I scored here in Florida. Have I admitted to y'all that I have a problem with buying these things... for my sale. But then when I finish them... well... I wanna keep them. Oh sigh... why can't we all just live in mansions and have money trees. Lord, the world would be so different, wouldn't it? Actually a scary thought. So back to this beautiful table. My hubby went and picked this beauty up for me while I was visiting in North Carolina. It was missing the bottom to the drawer and had a lot of scratches. I know I hear a lot that I shouldn't paint this or that because they are pretty "as is" and that is very true. 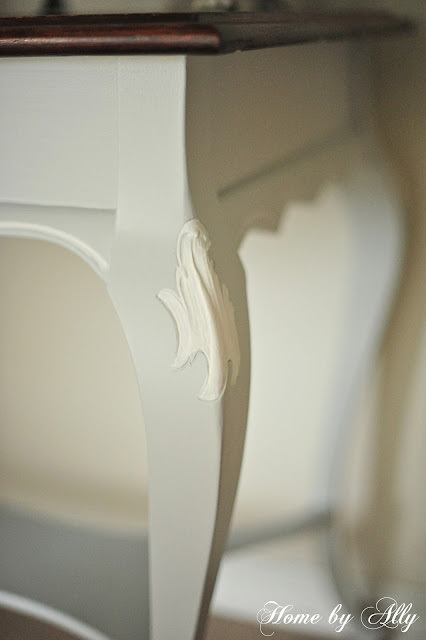 This was a very pretty antique as is but I felt like those beautiful details needed to shine! Heres' the before below. Ok... I have to admit. I adore this piece. And I'm going to be really sad to see it go. The color is by Valspar called "Light French Grey." Be still my heart. Everything in the photo I love. The boxwood topiary I adore. And I just picked up the faux bird cage type thingy with the claw foot legs. LOVE. I've been contemplating painting the mirror. Or just selling it at the sale. What do you think of it? 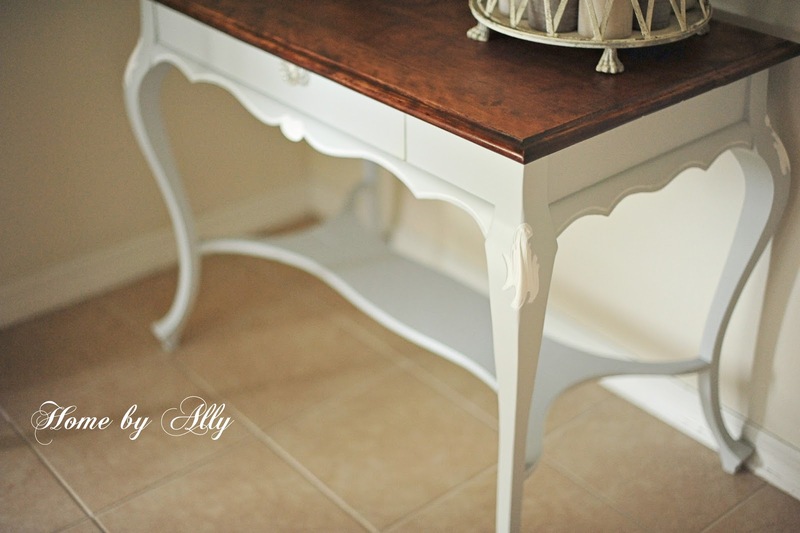 I tried something different with the top of this entryway table. I used a variation of a couple of different types of stains to get a worn, been through decades look. And I kinda like it. Some people might not and that's ok. Because I do and that's all that matters, right? You can see the sweet scalloped edges in the photo below along with the elegant details along each curved legs. I choose white against the grey which work beautifully together. 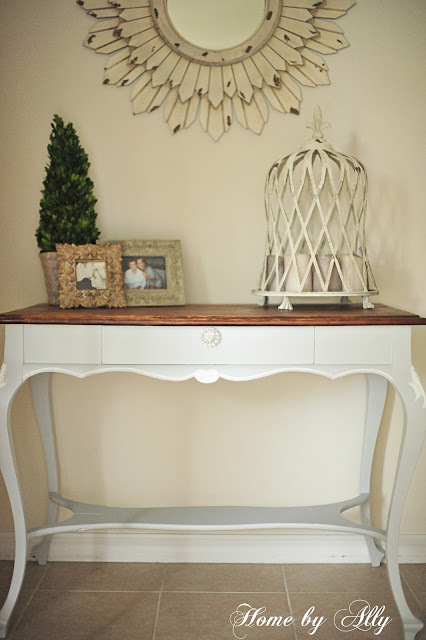 I just can't stop swooning over this piece! Here's a better shot of the details. I mean seriously, you WANT to highlight those! Come on! Amazing. I just love it. What do you think of it? Do you love the grey and my signature stained top? I'm really satisfied with this piece and I cannot wait to hear what people think of it at my big sale this weekend. Which, did I mention that I am starting to get nervous? I do every time. It's an Ally thing. So, let's recap. Here's the before again below. And let out a sigh of relief because here is the after. For now, I have to go work on the rest of the furniture I have for the sale. But I do have to tell you that this sale will be bigger than the last 2. I have a lot more items along with furniture I feel like anyways. And I think things will go well. At least I hope they do! Are you going to be able to make it? I hope so! I cannot wait to see and meet everyone! What a pretty colour! You're right the details do stand out more now... it looks so pretty!